So, I have a new job! YAY! Full time, set hours, a schedule, no longer a student…life is good. But now that I’m officially not a student, my time is suddenly free in the evenings – when I used to have classes, I now have nothing (except going out with my handsome man). Alrighty, what to do…what to do? Ummm. Sew? YES YES YES YES YES YES YES YES YES YES YES YES!!!!!!!!!!!!!!!!!!!! SEWING!!!!!!!!!!!!!!! I haven’t updated in a while, but since my last post, I’ve made 4 shirts, refashioned 2 shirts, and sewn a retro (styled and constructed) cardigan. I’ve got a list as long as my arm with projects to do and new things to try. And then…oh and then: the experiment. The experiment looks like this, but is definitely different, including more accurate cutting of tulle, the right kind of tulle (not netting like she used), and using a rayon/linen neutral blend for the backing (I’m sewing it directly on instead of having it swing free – less likely to snag and tear). 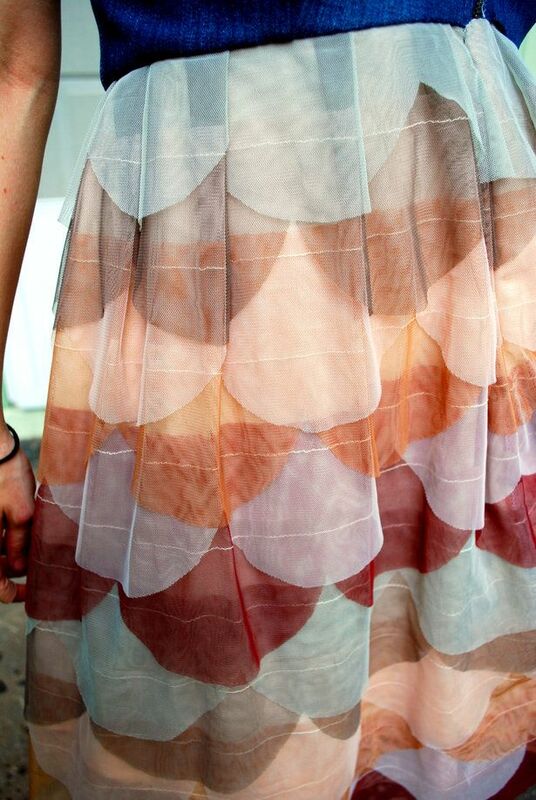 As for the cut of that skirt all I can definitively say is: pleats – really awesome/unique and structured pleats. Beulla (that’s my 1970’s Kenmore) is gonna get a work-out and make me a Bella!